Large companies are being disrupted by the pace of change. 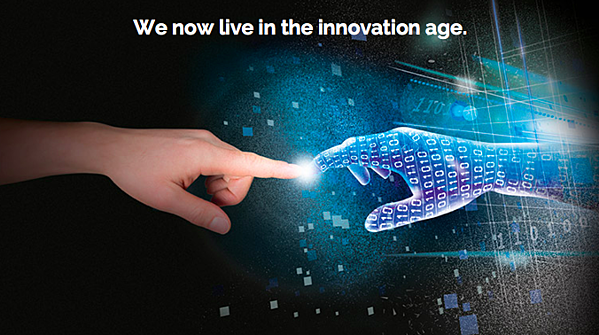 Innovation has become an imperative for their survival. But most large companies were designed to deliver steady, incremental returns. How can organizations transform themselves to deliver high growth and longevity through innovation? Innovation-driven growth is about steering into expanding markets, expanding your share through new products and adjacent markets, and even creating entirely new markets. In this report, Suzan Briganti defines how companies can transform their ability to deliver growth through innovation – through proven approaches to organizing, staffing, leading and culture of innovation. Suzan Briganti has worked with Fortune 500s for three decades helping them drive growth through innovation. 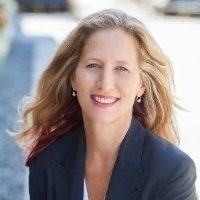 She is the founder and CEO of Swarm Vision, a Silicon Valley software company for innovation managers and recruitment, and a sought-after speaker and writer on innovation management. 9. Creativity vs. Innovation — What’s the difference? Inorganic growth – Acquiring revenues through mergers and acquisitions (M&A). Productivity gains and cost reductions can help you keep more of that growth, but they are no substitute for top-line growth. In fact, McKinsey found that top-line growth is vital for survival. “Companies whose revenue increased more slowly than GDP were five times more likely to succumb in the next economic cycle, usually through acquisition, than a company that expanded more rapidly.” The problem is that the majority of most companies’ workforce is focused on continuous improvement (cost and process efficiency), not top-line growth. Innovation is the process of finding and capturing new opportunities. It is concentrated in the first two growth drivers: tapping into an expanding market/ creating new markets; and expanding your share of the market. This article provides proven methods of organizing, leading, and hiring for innovation-driven growth. So we know that innovation drives top-line growth. But how can companies capture innovation to drive growth? According to Harvard Business Review, most companies invest about 70 percent of their resources on Core Innovation (Incremental and Continuous Improvement), despite the fact that Core produces only 10 percent of their ROI. A whopping 90 percent of the ROI from innovation comes from Adjacent and Disruptive Innovation. Yet remember, the lion’s share of the workforce in large companies is focused on maintaining the Core! A new report on The State of Innovation found that 82.8% of large companies say they are at risk of disruption, but 78% of their portfolios are invested in incremental changes. No wonder companies are being disrupted! But the way companies hire workers has not really changed that much since the First Industrial Revolution. Back in the early days of mass production, companies sought workers who were reliable, followed establish procedures, could tolerate a lot of repetition, strict oversight of their work, and were respectful of authority. These traits were highly prized because they led to lower machine down times and product defect rates. When making the transition from hand-made to machine-made goods, product consistency was highly prized, and it made total sense to hire workers with these traits. Today, companies need to hire for very different skills. Individuals often find themselves members of several virtual, fluid teams distributed around the globe. Teams are not only cross-functional but multi-cultural. They have to problem-solve at high speed, with little to no guidance from the past. Teams need to rapidly build trust, learn quickly, and pivot often. Today companies need workers who can thrive in uncertainty, learn continuously, have a growth mindset, grit, the ability to synthesize from disparate sources, and constantly create the new. We find that companies know how to hire for defined functional skills, like manufacturing, accounting or compliance. Resume “bots” can match key words, education, and years of experience, the basic specs. But when it comes to identifying traits needed to thrive in the Innovation Age, companies really don’t know how to do that. As you move further from your company’s core competencies and markets, to furthest away from them, you have to thrive in greater uncertainty. It follows that, the skills needed for core innovations are quite different from those needed for adjacent and transformational innovations. It turns out that eight skill clusters are highly correlated with business results from innovation. Results such as profitability, hyper-growth, international or global expansion, top-quadrant analyst ratings, loyal, repeat customers, acquisition and IPO. Individuals with high Swarm scores tend to achieve 3 times the business results as those with low scores. We see the same kind of results from teams. And companies with a high mix of Adjacent and Disruptive innovators (based on Swarm scores), tend to experience much faster growth. In the example below, both companies are 75 years old, US-based and in the hardware business. In the slow-growing company, only 17 percent of their workforce sampled scores in the Horizon 2 or 3 range (Adjacent and Disruptive Innovation). At the fast-growing company, 38 percent of their workforce sampled scores in the Horizon 2 or 3 range. Finding innovators with a high mix of the 8 skills is the first step to innovation success, and with Swarm, finding them has become easy. But it is also critical to understand how innovation teams are different, and how their leadership must also be profoundly different. Where ordinary teams work at a steady pace, innovation teams are more “wavy". Where functional skills and expertise drive ordinary teams, mindset and intrinsics rule the day on innovation teams. Whereas leading an ordinary team requires the leader to Manage, Coach and Inspire in that order, it’s the reverse order for leading innovation teams. "Innovation teams need to be thought of differently, and the number of teams that can afford not to be innovation teams is dwindling." Linda Hill at Harvard studied exceptional leaders of innovation—how they think, what they do, and who they are. Innovative organizations are not designed by accident, or to produce incremental results. But to be capable of innovating continually over time. The rhetoric of innovation is often about fun and creativity, but the reality is that innovation is hard work and can be a very taxing, uncomfortable process, both emotionally and intellectually. By definition, leading innovation cannot be about selling a vision to people and then somehow expecting them to execute it. Innovation usually emerges when diverse people collaborate to generate a wide-ranging portfolio of ideas, which they then…evolve … through give-and-take and often-heated debates. Thus collaboration should involve passionate disagreement. Innovation also requires trial and error. Innovative groups act rather than plan their way forward, and solutions emerge that are usually different from anything anyone anticipated. Finally, creating something novel and useful involves moving beyond either-or thinking to both-and thinking. Disagreement, trial and error, both-and thinking....these are delicate waters for leaders to navigate. What are the best rules of engagement for leading innovation teams? So it is clear that we need different skills on innovation teams, that innovation teams work very differently and must be led very differently. 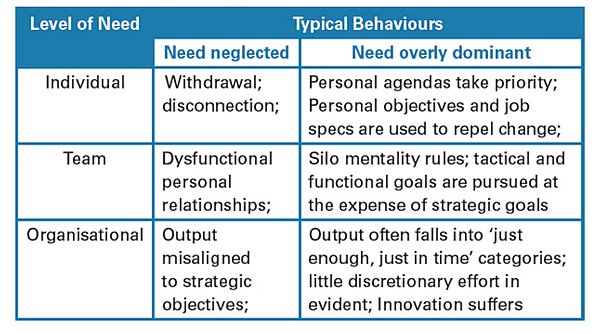 But how do you design high potential innovation teams, especially for Adjacent (H2) or Disruptive (H3) Innovation? A team with high "Create" and low "Connect" scores may generate a lot of ideas, but lack the inter-personal skills to garner support from the mothership. A team lacking in “Control” may overlook the all-important task of commercializing the invention. Innovations that fail to make money will wither. A team with weak "Deliver" scores may lack the adaptability and resourcefulness to get traction on meager resources. They have to stay alive long enough to prove they are onto something big. If it is truly a Disruptive (H3) Innovation endeavor, it may entail a very novel business model, and take the team way outside the company’s knowledge and market. You need the core team to score in the Disruptive (H3) range on Swarm scores (75th percentile+). If it is an Adjacent Innovation endeavor, they can score in the 50th-74th percentile range. 2. You also need the team to have coverage of all 8 Swarm skills, meaning at least one team member scores in the desired range on each of the 8 Swarm skills. Understand whether the leader is complemented by the rest of the team , or if there is a disconnect. If the leader is wired for H3 but furnished with an H1 team, he/she may become frustrated, or the team will overly rely on the leader. If the initiative is really an H1 project, don’t waste an H3 leader on it, as he/she will constantly be straining the team to deliver a more disruptive solution than the company wants, and burn people out. 3. Obviously, you need the team to have diverse functional skills. For example, do you need people who can design, code, sell, and create financial models? The more diverse they are, the better – simply because this will help them consider many points of view before latching onto one. 4. Set a common purpose. As big and audacious one as makes sense for the mission. Discretionary effort is joyous, and is never inspired by an incremental goal. 5. The team needs to begin by setting the “group norms” that Google identified: conversational turn-taking and psychological safety. In this way, each person can contribute their full innovation and functional skills to the common purpose. Team 1 is suited for Adjacent innovation, with an average score of 86 (in the 50th to 74th percentile range). 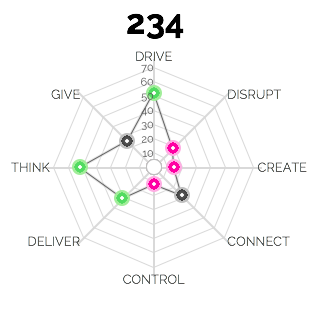 Disrupt, Create, Connect and Deliver scores are strong but not at the H3 level. 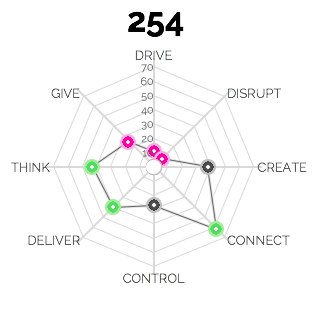 Team 3 is suited for Incremental Innovation with an average score of 74 (in the 25th-50th percentile range). While high on Drive and Deliver, Team 3 doesn’t have the Disrupt, Create or Think scores to thrive that far outside the Core. On Team 1, the leader is so much stronger than the rest of the team on Disrupt, Create and Control that the team may end up leaning too much on him or her. The leader may get frustrated by the team’s inability to break boundaries or generate novel ideas. 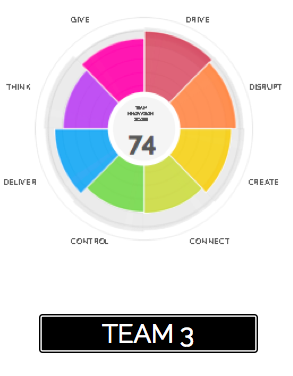 Adding some team members with higher Disrupt and Create scores will help this team make faster progress on their Adjacent (H2) Innovation initiative. 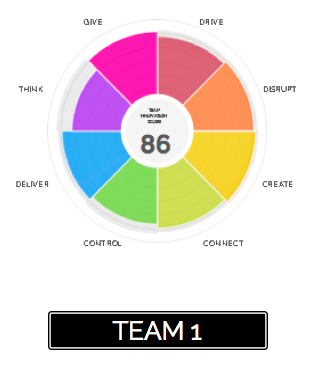 On Team 3, the team is as strong or stronger than the leader on Think, Deliver, Control, Connect and Create. The leader’s strengths in Drive, Give and Disrupt will enable him/her to set a vision, and drive to success, while sharing success with all. But the leader may be inclined toward a more ambitious vision than the team can deliver. This is a solid H1 team with more of an H2 leader. The leader may be better utilized on an H2 initiative. So what matters more, the innovation talent (the embryo), or the culture it lives within (the womb)? The answer is both. One without the other is not sufficient. Let’s say you have managed to hire a swath of true innovators (the talent). You have appointed great leaders steeped in the art of creating psychological safety. What can possibly go wrong? As an innovation initiative at a company takes off, often, the larger organization goes into “organ rejection mode.” This is why CEO air cover is so critical, along with a sacrosanct budget for Adjacent and Disruptive Innovation. When the larger organization feels threatened by innovation, they can use short term agendas to repel change, retreat into a silo mentality, and “slow walk” support for the innovation program until it dies. This is where structure and culture come into play. Does this behavior look familiar? The “parent” organization (the mothership) must be motivated to share resources with the “child” (the innovation team). The child must be free to challenge the parent. The parent must live on, regardless of the child’s success. How can this balance be achieved? When companies attempt to pursue innovations that lie beyond their current products or markets to drive growth, what organizational and managerial structures do they use? What works, and what doesn’t? Within existing functional designs, groups are completely integrated into the regular organizational and management structure. They form ambidextrous organizations, where the breakthrough efforts are organized as structurally independent units, each having its own processes, structures, and cultures, but integrated into the existing senior management hierarchy. So which of the four org structures works best for innovation results? Yes. Swarm can be used to identify ambidextrous leaders and managers. Finally, ambidextrous leaders must model, recognize and reward the 8 innovation skills, and advocate for them inside the mothership. This creates the innovation culture (the womb). The ambidextrous leader also keeps the innovators connected to the larger corporate strategy. Creativity vs. Innovation — What’s the Difference? It is important to clarify that creativity is not the same thing as innovation skill. Sometimes the two terms seem to be used inter-changeably. 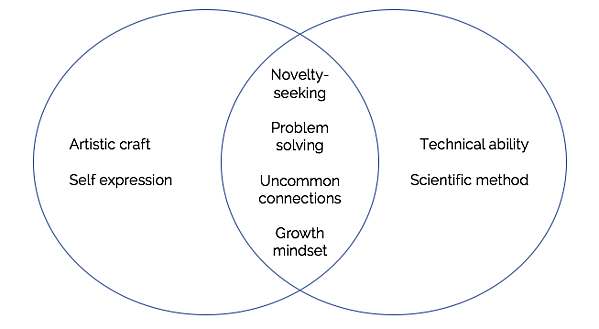 Swarm research uncovered 8 innovation skills, only one of which is "Create." At Swarm, we define innovation as a “novel solution that achieves commercial adoption.” It may include an invention. But it must go well beyond that to be considered innovation. It may include artful design or a unique brand identity, but it must solve a real human need that people will pay money for, as well. So what is the role of creativity in innovation? Let’s contrast Artistic Ability (far left below) and Invention Ability (far right). Artistic Ability involves mastery of a craft (such as a visual or verbal art) and a drive for self-expression. While essential ingredients in Artistic Ability, craft and self-expression were not highly correlates with positive innovation business outcomes. Artists and inventors may (or may not) also have the traits inside the overlapping part of the Ven diagram. But innovators need to have these Create skills. And as a team, they also need the other seven skills: Drive, Disrupt, Connect, Control, Think, Deliver and Give. So far, we have talked about the role of innovation in driving top-line growth. 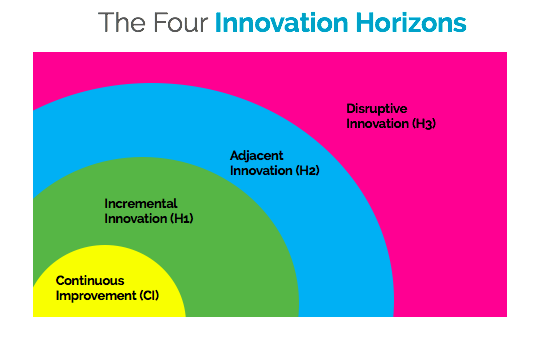 We have covered the four horizons of innovation, and their contribution to growth. We’ve unveiled the 8 skills companies need to hire for in the innovation age, and some of the key ways innovation teams are different from conventional teams. We’ve touched on how leading innovation teams requires profoundly different approaches, and the most successful way to structure for innovation success. Finally, we distinguish between often-confused creativity and innovation talent. How do real companies use this knowledge? HP is known as one of the founders of Silicon Valley. They are the world’s largest PC maker. But as PCs have become somewhat of a price-sensitive commodity, how did HP go about driving faster growth and profits? HP hired a legendary innovator, Jon McCormack. Prior to HP, Jon led Google Advanced Projects, and before that, was CTO of Amazon Devices. Jon was brought in by HP to transform the PC experience through software. Jon and I met at a small social event. When I told Jon that Swarm software identifies innovation talent to drive growth in large companies, his eyes opened wide. Jon had joined HP to lead a business into a completely new area and drive both growth and profit. He suspected the existing team needed additional skills, and so he was thrilled to find Swarm Vision. Jon moved quickly to use Swarm. Get a baseline: Jon used Swarm to get a fresh view of his workforce from an innovation perspective. Swarm data clearly revealed the talent he had on staff, and didn't have. Set a bold vision: Jon articulated the new mandate his unit needed to deliver on - to transform the PC experience through software. Take action informed by the data: Jon used Swarm data, along with organization reviews and diversity, to redesign his organization to deliver breakthrough innovation. The results? A much higher innovation output, AND (surprise) much higher employee engagement, in just six months. What can we learn from a serial innovator like Jon? Innovators are extremely curious and open. They'd rather beg forgiveness than ask permission. And they use data and tools to do things better and faster. If you're like a lot of innovation leaders, you look to Silicon Valley for inspiration on your journey. Swarm is a concrete, proven Silicon Valley tool that you can use at your company to accelerate your innovation success. So, what should you do now? Perhaps start by taking the Swarm Innovation Profiler yourself here, and sharing 15 free licenses with your colleagues. Retaining and leveraging the H2 and H3 innovators you already have. Intentionally hiring more H2 and H3 innovators. Designing teams with a view to their innovation profiles. Designing an ambidextrous org structure. Driving a culture that supports and rewards the 8 innovation skills.